Reuse-in-the-small (libraries or subroutines) began nearly 50 years ago and is a well-solved problem. Reuse-in-the-large (components) remains a mostly unsolved problem, even though everyone agrees it is important and desirable. Now we like to think we’re so much better off. Look at cave man. He can’t reuse software. He can’t even boil an egg. Look at us now. We have mechanical egg poachers and GitHub and NPM. Using a library (jQuery, Bootstrap, React) is still “reuse-in-the-small.” Bigger reuse means more homogenization, and all programmers have not-invented-here syndrome to some degree that usually teeters between healthy and unhealthy. We like our own software because we know how it works, we know how to fix it, and it works exactly how we want it. We don’t like pre-written software that we can’t control. That’s why programmers lose their minds when they see something like Ruby on Rails that generates a working MVC app based on some database tables. Of course the reality ends up being something different, but you could almost hear the internet erupting with excitement back when Rails was first introduced. Anyways, Glass’s proverb remains true. Code reuse in small parts is solved. 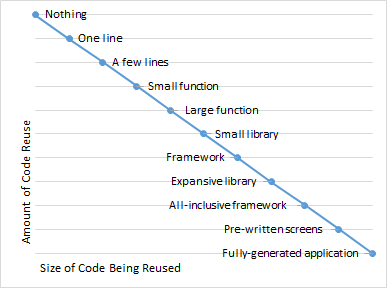 Code reuse on a large scale is wanted but still far off.